This green buffet cabinet was custom designed for a private palazzo residence in Florence. Made in the late 1930s, it was part of a dining room which had an entirely green decor. The three door panelled cabinet is executed in solid elm and oakwood, with a double and a single door. There are two locks and two keys. The interior consists of three drawers and three shelves. The piece is painted so that the beautiful wood grain is kept visible. The green color combined with the brass handles give this piece a refined and elegant appearance. Due to its dimensions this buffet cabinet could also be used as a sideboard or credenza. 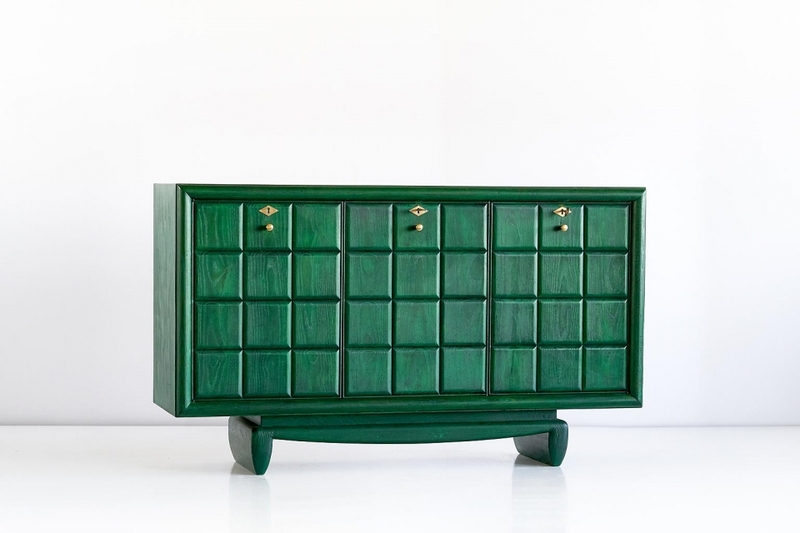 We have a matching console available from the same provenance: http://kabinethubert.com/Inventory/green-italian-art-deco-console-designed-for-an-important-florentine-residence.